When Napoleon in 1798 left for Egypt with 54.000 soldiers and sailors to secure an alternative route to the riches of India, he also included 154 scientists and a library of 287 books in his entourage. His ambition was to continue the tradition from the French Encyclopedia 'Encyclopédie ou Dictionnaire raisonné des sciences, des arts et des métiers' (1751-80), the prime publication of the Age of Enlightenment, and to explore scientifically the culture of ancient Egypt. The 154 scientists from all fields of science made up for Napoleon's corps des savants, his living encyclopedia from l'Institute de France, named Commission des sciences et arts d'Egypte. Before being left behind with the army in 1801 they managed to study almost every aspect of ancient Egypt, later to be published in the monumental Description de l'Egypte. In 26 volumes, of which the first was to appear in 1809 and the last volume not until 1828, several years after Napoleon's death. Almost 300 artists and printers were participating in this collective masterpiece of the Age of Enlightenment, producing 837 cobberplates for 3000 illustrations on a new fast printing press with reproductions of high quality. In three days it could produce what an artist earlier spent six months to complete by hand. An abridged and popular edition was published already in 1802 by the author Vivant Denon: Voyage dans la Basse et la Haute Egypte. And soon Europe was put on course for an Egyptian fever which had quite an impact. 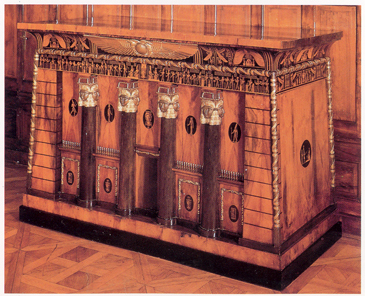 The 'Egyptomanie' was born and a romantic fascination was to influence the first decades of the 19th century Europe. As can be seen from the style of the magnificient case for the volumes of the description, designed by Abbot Albert IV for St Peter's Abbey in Salzburg. Also Napoleon brought with him a printing press, with founts in Arabic as well as in Latin and Greek. This press gave birth to the first printed edition of the Quran, thus to breaking the Islamic ban on printed books, a ban routed in the understanding of calligraphy as the untouchable queen of arts. The Egyptian expedition was a military disaster, but a great scientific achievement. As a young boy it inspired Jean Francois Champollion to take up the study of eastern languages. This was the basis for his major success in the decipherment of the hieroglyphs on the Rosetta Stone, written in Egyptian in both hieroglyphic and demotic script as well as in Greek. 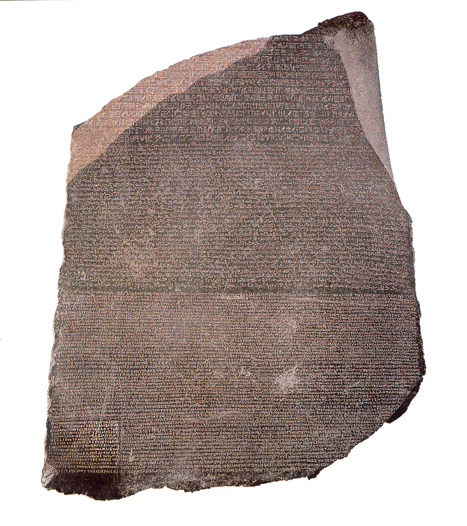 The stone provided the key to the ancient Egyptian tradition and ended up in London at the British Museum along with The French Expedition's other larger archaelogical finds, according to the French surrender list. The smaller parts went home to France in the scholars personal baggage. Before the stone was handed over to the British, several copies of the inscription were taken and made available to scholars for study. 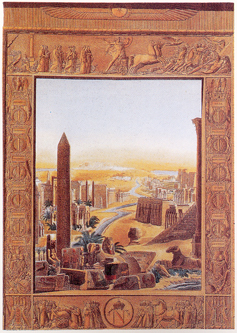 And in the early 1820s the door to the past was finally opened by the publications of Champollion on the hieroglyphs. This turned out to be the ultimate outcome of the expedition. * Description de l'Egypte, ou, Recueil des observations et des recherches qui ont été faites en Egypte pendent l'expédition de l'armee francaise. Napoléon I (empereur des Francais 1769-1821) (Auteur). Edme Francois Jomard (Editeur). Paris, l'imprimerie impériale, 1809-1828. 26 volumes, plates, maps.